FOOD FOR CHANGE looks at the current resurgence of food cooperatives in America and their unique historic place in the economic and political landscape. Born in the heartland, cooperatives are seen as the middle path between Wall Street and Socialism. The film profiles several food co-ops that have revived neighborhoods and communities - right in the shadows of corporate agribusinesses and supermarket chains. It's an inspiring example of community-centered economies thriving in an age of globalization. "If you want your students to understand relationships among the environment, food, economics, democracy, and government...then you want them to see this film. This is the rare, uplifting but honest film about history and possibilities; about how things are and how they might be. Today more than ever it is important for them to understand the role of politics and policy in their own lives and what they can do about it where they live." "Food for Change is about food coops as meaningful - and highly successful - alternatives to our country's current industrialized food system. It situates the cooperative movement in 20th century history and focuses on its role in social change by establishing deep roots in local communities. This film should inspire anyone interested in creating socially just, community supported, and economically viable enterprises." "Food for Change is just the kind of nourishment our minds and hearts need right now! 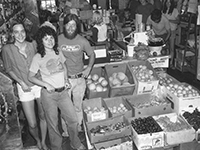 The documentary explains key historical moments and trends, traces the multiple roots of the cooperative food movement, and illustrates how groups and communities are taking charge of their food futures. This is an indispensable resource for people who want to understand how a cooperative vision can guide one of the most important domains of the economy and our lives." "Food for Change is an inspiring but also hard hitting and realistic historical look at the up and down road for Co-ops in the US. It does an excellent job of conveying the broad social, economic, and environmental potential of these entities and would be a tremendous introduction and training tool for Co-op members and leaders." "In a time when 'local,' 'organic,' and 'sustainable' are terms regularly used by large grocery chains to encourage an illusion of a food system customers want it is important that students know the critical - though often unnoticed - roles that co-ops have played for generations connecting consumers to farmers with democracy, honesty and transparency." "Historic and contemporary footage, expert interviews, and archival stills offer a broader context for [the filmmaker's] comments, which position the co-op movement with a frame of democratic values that are being expressed through an economic enterprise...A fine documentary on a timely subject, this is highly recommended." "An entertaining historical overview...May inspire general audience viewers to seek out their local co-op as an option...Provides some points to consider for those that might be looking to open a co-op in their own community." "This film is absolutely a well-researched, superbly compiled and masterfully delivered work...It is an inspiring and emotionally passionate fruit of labor and compassion. It begs for sharing, opens the door to involvement and solution." "I felt energized by the movie. I loved all of the historical background and couldn't help feel that what we're doing will be historic someday too. The movie made me believe that we can do anything!" "Highly Recommended...A motivating work, clearly detailing the financial soundness, consideration for the environment, and community-centeredness imbued in cooperatives. This work clearly communicates the needs for a sea change in thinking in production and agriculture on the macro scale, and highlights the benefits to employees and consumers."